A game aimed at keeping children safe online by reiterating what is ok and not ok through play! Players move tokens from 'Start' to 'Finish' by reading messages and following instructions on cards. Cards have safe or risky messages on them. Safe cards help tokens to progress, while risky cards may push them back! 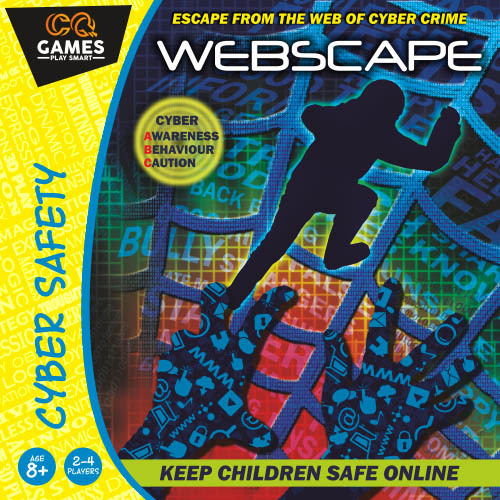 The cards of Webscape cover various online scenarios that kids face and actions they take. For each action, the cards indicate how tokens should be moved. Positive actions allow players to progress, while negative actions have the opposite effect! Through play, it becomes easy to recall what you should and should not do when online! IMAGINATION STORY BUILDING VOCABULARY LEARN HOW TO PLAY → .PDF Instructions BUY NOW!